In order for bipedal robots to live up to their potential usefulness, it’s important that they can navigate on a variety of different surfaces and deal with whatever potential obstacle is thrown their way. 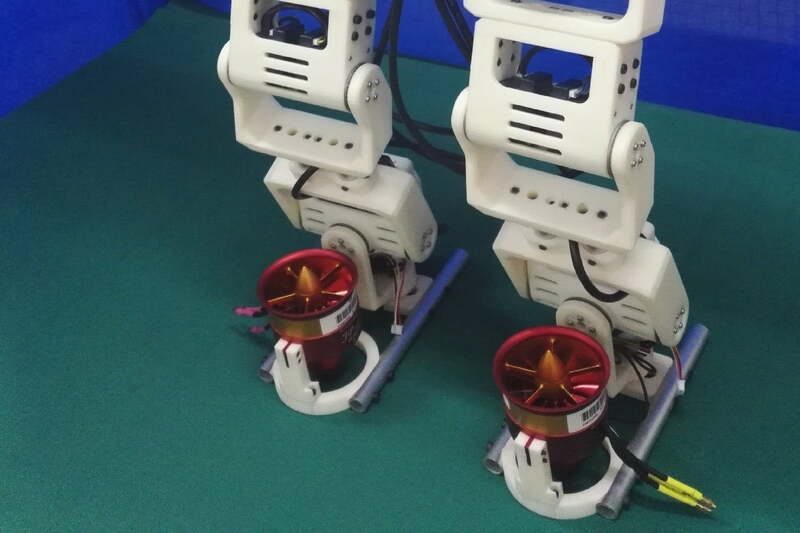 That’s something that researchers from China’s Guangdong University of Technology’s School of Automation have been working on with a new self-balancing robot called Jet-HR1. Thanks to jet-powered feet, Jet-HR1 is able to step over extremely large chasms equivalent to around 97 percent of its leg length. In order to do this, the robot essentially performs the splits, by balancing on one leg while reaching the other one out to bridge the gap, before repeating the process to move the other leg across as well. The need for jet engines on the feet comes down to the essential problem to be solved with this robot. When you take a long exaggerated step over a chasm, you shift your center of gravity to accommodate the movement. In the case of Jet-HR1, this is achieved by using ducted-fan jet engines on each foot, which can output a thrust equivalent to almost one-third the robot’s weight. Huang suggested that robots like this could one day play a valuable role in search-and-rescue applications, such as in the aftermath of natural disasters. As a possible next step (no pun intended), Huang said that the team is interested in expanding movement to cover more dynamic explosive actions, such as jumping.